IMPORTANT NOTE: Ricochet service is no longer available in the form in which it's described here. Metricom, Ricochet's parent company, went bankrupt a while back. Since then, Aerie Networks has bought the Ricochet infrastructure and is attempting to restart it/roll it out in select markets. Currently it's only available in Denver. The new network is supposed to be quite a bit faster (128Kbit/s), but it's unclear whether there remains a market for this service. For the past several months, I've been using a Ricochet wireless modem with my laptop computer for Internet access. The short summary? It's one awfully interesting gadget. Wireless data service has traditionally been expensive. Most of us are familiar with the highway-robbery rates charged by cellular telephone companies in the relatively recent past. Though prices have dropped somewhat as a result of increased competition, it's still expensive to use a cellular phone for a long period of time. Cellular companies attempt to justify this expense by pointing out the fact that they had to buy their radio spectrum from the government (at a cost of literally billions of dollars). 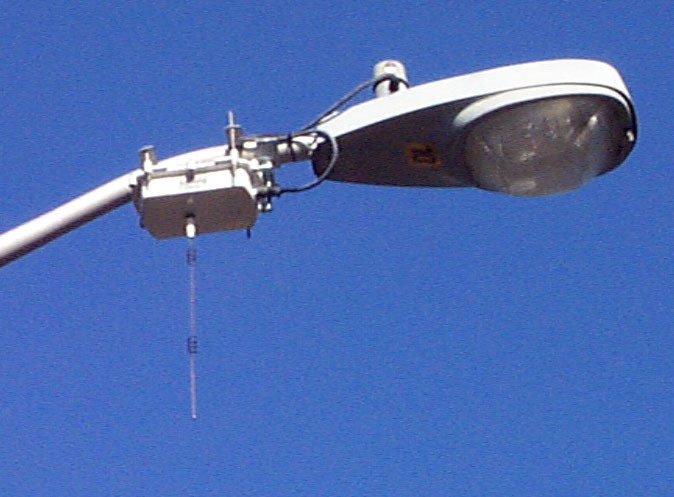 They also have to maintain a fairly expensive infrastructure (transmitter sites and the associated cellular towers). Mostly, though, they charge high rates because they can get away with it. Take Skytel's two-way Skywriter paging service, for example: at the time of this writing, their data charges range from $0.0025 to $0.01 per byte transmitted! If you were receiving this page via their network, it would cost you between $125 and $500 (that's right: hundreds of dollars) to load this page and the small inline images it contains. It probably won't surprise you to learn that wireless data hasn't exactly taken the world by storm at those prices. Metricom, the Los Gatos, California-based company that runs the Ricochet network, has taken a different approach to wireless data. Instead of purchasing radio spectrum, they're using unlicensed radio spectrum (between 902 and 928 MHz). 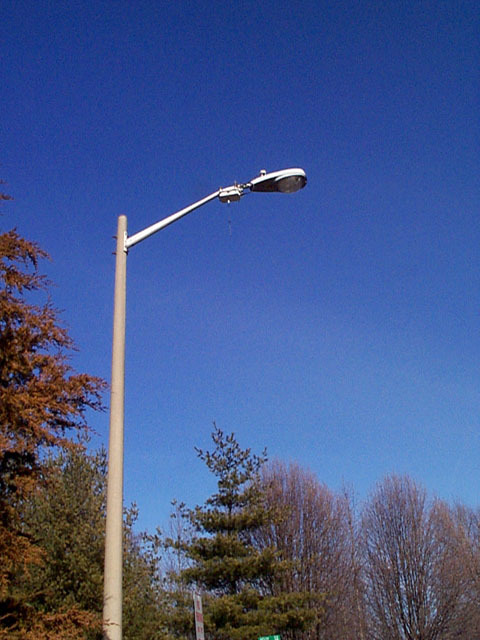 Rather than construct large towers, the Ricochet transmitters are hung from existing infrastructure (usually street light poles). This approach requires a lot of transmitter sites. Metricom places one of these "microcell radios" every quarter-mile or so within the areas covered by Ricochet service (currently the Washington, DC, Seattle, and San Francisco metropolitan areas as well as a few airports; detailed coverage information is available from Metricom's web site). 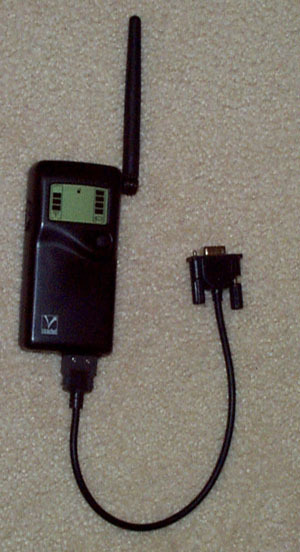 A Ricochet modem can be used in any coverage area with no roaming charges. What's really neat about the microcell radios is that they don't each require a connection to the Internet. 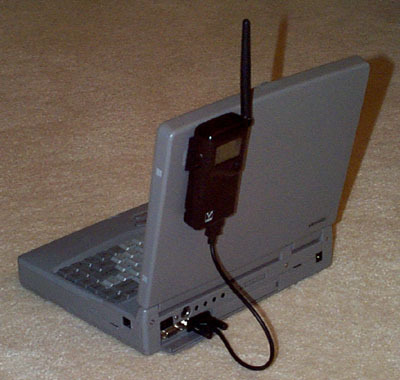 Instead, the microcell radios can communicate with each other in order to route packets to a "wired access point," which is a radio that is connected to the Internet (via a leased line like a T1). If you'd like more details on the design of the wireless network, have a look at Metricom's network overview page. All of this technology boils down to one thing: wireless Internet service at a flat rate of $30 per month. You communicate with the Metricom infrastructure using a Ricochet wireless modem. I've been using their "Wireless Modem SE," an 8-ounce device about the size of a small cellular phone. It costs about $350. Several other modems are available from Metricom; details on these modem can be found at their Web site. The modem plugs into the serial port of your computer just like an external modem. It also comes with a little patch of Velcro so you can fasten it to your laptop. A rechargeable battery is supplied with the modem, as is a power adapter/charger. Battery life is quoted at 6-8 hours assuming you transfer about 500 kilobytes per hour. I think most users will actually transfer more, but one's laptop battery is still likely to be the limiting factor. A power switch, a pushbutton, a speaker, and an LCD display make up the user interface of the modem. To use it on the Metricom network, one need only turn on the modem. After a few seconds, a "signal acquired" icon shows up. After a couple of seconds in which your modem's subscription is verified by the network, the modem will beep (the beep is easily suppressed if you like) and display a signal strength indication (betweeen zero and four LCD segments). When mounted on a laptop computer, the LCD display faces away from you, which makes it hard to read the signal strength. Not to worry, though! By pressing a button just under the display, the modem will beep; the number of beeps denotes the signal strength. Little touches like this make it fairly obvious to me that the engineers behind the Ricochet modem actually use their own product (something which doesn't happen often enough in consumer electronic design). Once your modem has made contact with the Ricochet network, it acts like a Hayes-compatible modem. Dialing a special "phone number" tells the modem to enter PPP mode (SLIP is also supported). Since the modem acts as a PPP server, it's trivial to use Windows 95 or Windows NT Dial-Up Networking to access the Internet. I haven't tried it myself, but there's no reason to believe it would be any less simple on a Mac. Non-Internet connections can also be made: Ricochet modems can communicate directly with each other, and there's a telephone outdial service available as an optional service that allows you to make local calls within the Ricochet coverage area. The services you'd expect from a standard Internet service provider are there: IP connectivity, mail, and news. Unlike an ISP, though, there are no busy signals, and there's no idle timeout: since the modem doesn't consume any bandwidth to speak of when idle, it's perfectably acceptable to leave the PPP connection active all the time--in effect, you have a permanent connection to the Internet. Metricom claims data rates equivalent to a modem operating between 14.4 Kbit/s and 28.8 Kbit/s. I've been using the service in an area with good signal coverage, and my experience has consistently been at the upper end of this range. The modems have rather high latency (the time it takes for a packet of data to get from point A to point B). Depending on what you're doing, this can slow things down a bit and may be the reason Metricom doesn't claim better performance for the modems. In short, it feels about the same speed as a normal modem if you've got decent signal coverage. I should point out that I know a couple of folks who are using the Ricochet modems on non-portable computers. The reason? When you add up the cost of telephone service (about $15-20/month) and a flat-rate dialup ISP (in the $20/month range), you exceed the cost of Ricochet service, which replaces both. Add this to the fact that it's possible to be online full-time without busy signals or idle timeouts, and it's hard to make a strong case for wired service. Security is one of the reasons that you'd think of using landline service rather than wireless. The Ricochet modems appear moderately hard to listen in on, however. First of all, the transmission is digital and changes frequency multiple times per second, so it's technically difficult to listen to. Additionally, the modems implement RSA and RC4 encryption in hardware; this means that the wireless part of your communication can be transparently encrypted. I couldn't find information on the RSA key length, but the symmetric (RC4) key appears to be 256 bits long--strong enough that the modem can't be exported from the United States. But it looks like the RSA key is the same for all units when the public Ricochet network is used. I'd therefore look on the security as a guard against casual eavesdropping but not a determined attack--much like a conventional phone line. As if inexpensive full-time Internet access weren't attractive enough, technical information is readily available from the Metricom Web site. Of particular interest is a detailed manual for the modem. Available in HTML and PDF format, this guide has all kinds of goodies for the advanced user. It's possible, for example, to get the modem to spit out a list of microcell transmitters in the Ricochet network; this information includes the transmitter location (in lat-long format), signal strength, and latency (which can be used as a rough measure of distance). I found the microcell in the photos above by using one of these latitude and longitude pairs and a copy of DeLorme's Street Atlas 5.0. The documentation also covers an interesting connectionless mode in which one can send to (and receive from) multiple modems at the same time. There's lots of information here for the highly technical user, which is getting more and more unusual these days. Even more hard to believe, technical support is competent and responsive. I had to call in and report a DNS problem. The technician understood the problem and was able to get it fixed quickly. Then he called back to make sure it was working. Scary. Haven't these folks figured out that technical support organizations are required by law to be indifferent and clueless? I'm hard-pressed to come up with problems with the service, but I'll try. The digital transmissions from the modem can interfere with nearby electronics. Telephones and monitors seem particularly vulnerable; I also understand that medical equipment doesn't take well to digital noise in the immediate vicinity. This problem is basically endemic to the medium; digital cellphones display the same behavior. The service is only available in a few areas at present; true national or even major-metropolitan-area service would be nice. Deployment in New York City and Los Angeles/Orange County is expected this year. Service doesn't work well while moving. I've hear anecdotal reports of success, but my attempts to use it in a moving car (yes, someone else was driving!) were not terribly fruitful. It wouldn't hurt if access were faster. I understand that a planned network upgrade (due in 1999) should boost current equipment to around 56Kbit/s throughput. Feel free to drop me a note if you have questions that I didn't answer. I would, of course, also be glad to send in a referral if you're pretty sure you want to sign up. (I don't work for Metricom, but they do have a little free service kickback to subscribers who refer new subscribers). In short, if you live or work within the service area, Ricochet is one of the best options going for mobile or even fixed-location Internet service. It's impressive, well-thought-out, and well-supported technology: highly recommended.